New to the site, so thanks in advance for the help, and thanks for all I’ve already learned reading old posts. 1. Is it possible to buy just that connector and splice it in (both sides are fried, of course.) I’ve been looking at parts sites and can’t seem to find just that. Also, any recommendations on parts sites? and 2: why did this happen? Should I be looking at the stator and r/r as well? a little more info on the bike: the PO installed after market headlights that are super powerful... also a power commander. Not sure how much juice those use up, but the lights definitely use a good amount. Could they be overloading the charging system and have caused that connector to cook? The Stator and the reg/rec can kick out a lot of heat , but check them out first before you spend anything. The reason this happens is because that connection handles a good amount of current. It is AC current coming out of the stator (yellow wires), I'm not 100% positive what the f4i has for voltage, but it's in the neighborhood of 50volts AC on each yellow wire before it goes to the rectifier to get turned into dc and lowered to 13.5-15v. Over years between all the ac current flowing through that connection, and general wear and tear (dust, moisture, etc) the terminals become corroded. Once the connection starts to go bad, it accelerates it's wear and gets worse fast, until finally the connection isn't good enough, and the connection starts to generate heat inside the plug because it has a high resistance. This can also damage your stator (less likely) and your rectifier (more likely), although it doesn't always damage them. I'm not sure where you can purchase a f4i specific replacement plug, you'd have to cut the old wires off, and replace the actual spade terminals. You also have the option of using ANY sort of male/female plug you want, just keep in mind, you want something that will have a GOOD SOLID connection. And when you reconnect them, you want to pack the plug with dielectric grease. 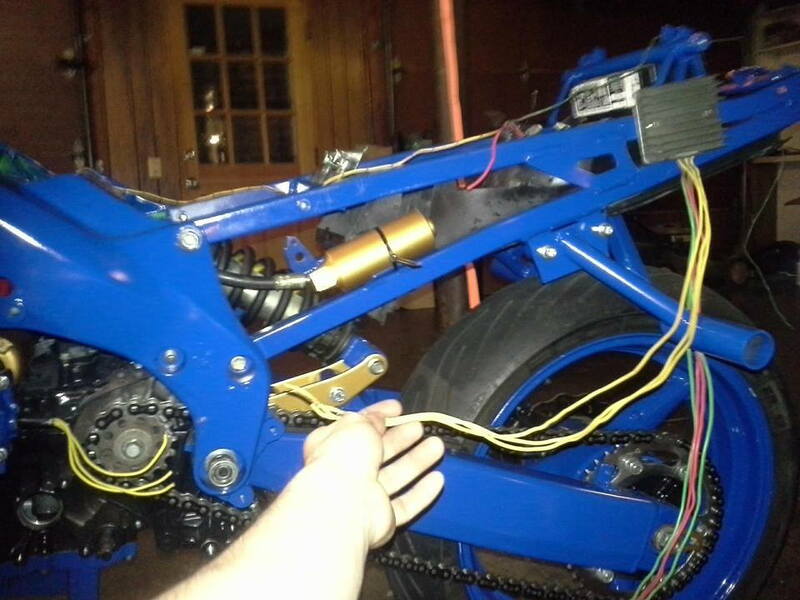 Another option is to solder the yellow wires directly from the stator to the rectifier. This is the best option connection wise, and their wires are separate of the main harness. The only issue is then your stator and rectifier are connected together until you cut or desolder them. Whatever you do ,the end goal is a SOLID connection that can handle 50v+ ac on each yellow wire, and over 500watts of power through the 3 yellow wires combined. Also make sure you strip the wires back until you have FRESH copper wire, don't reconnect corroded, green/black wires. You want FRESH COPPER! My charging system was fine, but my connection for hte yellow wires was all burnt up on this 2001 f4i I picked up. Since I'm re-doing my entire wire harness, I'm going to go ahead and solder my stator directly to the rectifier. I'll post this somewhere that might be more obvious for people looking for info like this, but I wanted to share a great resource- It turned out that my r/r got fried the same time that that connector from the above post did, and I read a lot about the oe r/r failing a lot. After a lot of hunting I found this source, and the guy- Jack- is super friendly and helpful and has access to some great r/rs and makes custom harnesses and mounting hardware for them! What is the name of this red and black electrical connector?